The Crested Butte boys’ Titans basketball team is peaking at just the right time, winning its last four games of the regular season and heading into the District tournament on fire. 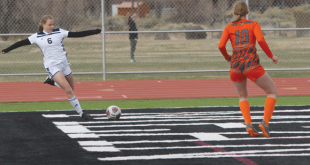 After two decisive wins a week ago at home, the Titans entered the final week of the regular season on the road against the Ridgway Demons on Tuesday, February 19. The Titans picked up right where they left off the week prior, forcing turnovers and shooting the lights out for a crushing 88-47 win over the Demons. Five players scored in double figures, led by junior John Wright with 17 points. Senior Alexei Desmarais was right behind him with 16 points and Carson Grogg had the best game of his senior year scoring 13 points. Senior guards Daniel Hargrove and Joe Bosshard had 11 and 12 points, respectively, for a complete Titans offensive output. The Titans returned to Mt. Olympus to face the Debeque Dragons on Saturday, February 23 for its final game of the regular season with a potential number-one post-season seed on the line. The Titans opened the game with three different players scoring the first 11 points of the game. Senior Randy Evans hit two free throws to open the first quarter and Hargrove split the Dragons defense with a drive through the lane for two more. Wright buried a three-pointer from deep in the corner and then fed Evans for an alley-oop off the glass to give the Titans an 11-7 lead. But it wasn’t all pretty for the Titans as they struggled shooting from the perimeter in the second quarter, allowing Debeque to gain momentum. The Dragons sank a three-pointer midway through the second quarter to threaten the Titans’ tenuous lead, but Crested Butte closed the half, outscoring Debeque 12-2 to take a 32-18 lead into halftime. Debeque refused to roll over, though, climbing back to within striking distance of the Titans until Hargrove and senior Will Curry took over. Hargrove and Curry combined for 10 unanswered points at the end of the third quarter to rebuild the Titans’ lead to 22 points heading into the fourth quarter. With Wright fouling out early in the fourth quarter Evans stepped up to score eight of his team-leading 21 points in the final quarter, icing the 67-46 win. “I was proud of that win because Debeque is a scrappy team,” says Titans coach Robin Loyed. Wright had 18 points on the afternoon and Hargrove scored 12 points, his third consecutive game in double figures. With the last two wins, the Titans record stands at 14-4 and, as of press time, are slated to enter the District Tournament in Delta Thursday through Saturday, February 28-March 1, the number one seeded team. If they make the finals, the Titans could face Ouray for the fourth time this year. While they’ve lost two of three to Ouray so far, Loyed hopes to see them again once more. 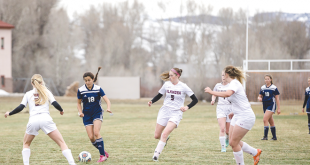 If the Titans do reach the District finals, win or lose, they automatically qualify for the Regional tournament in Gunnison to face either La Veta or Creede. A win there means the Titans’ first trip to the Great Eight 1A state tournament at the Air Force Academy in Colorado Springs.